Have you ever wished you could show off the inner structure of a Gunpla kit? Mesh is the way to do it. Some modelers cut holes in the top armor and place see-through mesh panels in them so people can see the hard work they put into assembling the detailed inner frame. Today’s tutorial from Ciaran will show you how fast and easy mesh application can be. Mesh paneling your Gunpla is both simpler and quicker than you think but pays off in a big way. I use it to show off just how detailed my Gundam models are both inside and out. A Gundam kit. I used an HG 1/144 Deathscythe Hell Custom EW for the tutorial. Tamiya Mesh Netting. I used black but it comes in a lot of colors like green and blue. Choose the part you want to use, and clip it out of the runner using your nippers. At this step, I also did some light sanding and nub removal because I plan on painting this kit later. However, it is not entirely necessary if you are simply trying/testing out this technique. After you have the part removed, take a moment to familiarize yourself with it. Really understand the lines, curvature, and features of the kit on both the outside and inside of the piece. Get to know it, maybe take it to a movie? (That last part was a joke.) The reason is because you want to make sure you use the curvature and lining of the part to my advantage. In this finished MG Zaku II 2.0, for example, you can see how I paid attention to the built-in divets in the armor to create a pattern with the mesh cut-outs. Once you have decided in your head where you want the mesh to go, you’re ready to start altering the plastic. Begin by using the pin vise (you could also use a hand drill), to mark the initial opening of the desired area. As you can see, the hole I drilled is imperfect and that’s okay. As I continue to enlarge the area, I can even it out. Continue using your pin vise to drill holes where the corners of the panel will be. Take a moment to ensure the holes are where you’ll want the plastic to be removed from. Now, drill more holes as a “dotted line” between the corners of the cut-out. I used an older pair of Gundam Planet nippers to cut the plastic along the “dotted line.” This will give you a very rough, yet sufficient, hole in the Gunpla armor. We’re not done yet! Use your sandpaper or file to smooth out the corners of the cut out. I used my file to get a straight, even line on each side of the opening. Then, I hit it with some sandpaper to get some of the loose rough plastic shavings off. This step is a bit subjective: use any sanding method that works for you, whether that means filing up and down or left-to-right across the cut-out edges. What matters is that the resulting edges are even and smooth. Once you’ve gotten this finished, the hard part is over! Take a moment to go flex in the mirror because you’re awesome. After congratulating yourself on a job well done making the opening so clean and amazing, there’s still one more thing to do. Lay down a sheet of your Tamiya Mesh and get a rough measurement of how much you need to cover the opening on the back side of the piece. It is completely okay if you overestimate the amount of mesh you need—you can always cut it down to size. Underestimating the measurement is harder to correct than if you cut out too much, so it’s better to veer on the side of excess. If you have the opening around curves, make sure the piece of mesh is large enough to fit smoothly on each edge while conforming to the natural shape of the kit. Now, put on your paper mask. You do not want to inhale any Tamiya Cement: you can and will vomit from too much of the fumes. Position the mesh where you want it to go, and use the Tamiya Cement applicator attached to the lid to brush on a generous amount of cement on the back of the armor cut-out where the mesh is going to attach. By “generous,” I mean you should have an even brushful of cement on each corner, not a big glob of glue. Too much cement can eat into the plastic! The cement dries fairly quickly, so avoid getting any on your hands or other areas of the kit. Gently apply the cement on one side of the netting at a time and use your X-acto knife—not your hands—to hold down the mesh so it adheres properly to the plastic. Continue this process on all sides of the cut-out until the mesh is nice and secure. Sometimes, positioning the mesh can be a real pain, so you must have patience. Place your newly detailed kit on your shelf and stare at it awkwardly for a long period of time. I’m not the only one who does that with my kits, right? Right? I want to add that it’s OK if your first attempt comes out a little messy. I’ve done this technique on many of my kits now, and I think it gets better every time I try. Thanks for reading! Remember, wealth and glory to the victor! About Ciaran: I’m still an amateur builder in my eyes. However, Gunpla is all about growing and making it your own. That’s what I’ve been doing for years now. I’ve built a little over 25 kits so far and I don’t plan on stopping. 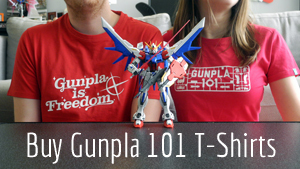 Recently I was brought into a Gunpla team that goes by TheGundaMoshPit. These builders are my plamo family. I live in Michigan and my main daily focus is my daughter, who is 2, and work. I wish I had more time to build than what I do, but I make the most of what I have. Always trying new techniques and skills is a great way to grow and thus that is what I do. Please follow my Instagram @daemons_blaze.